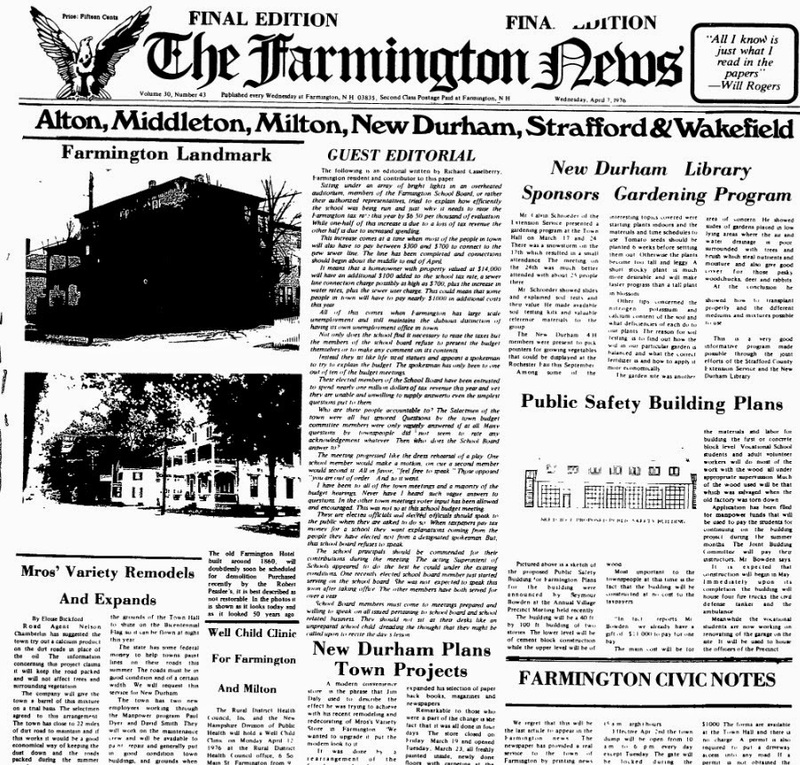 "The Farmington News Digitization Project is Complete"
This digital archive contains all issues of the Farmington News, of Farmington, New Hampshire. The newspaper was published every Friday by J. E. Fernald and Son. Over the course of time, the paper moved to a Wednesday publication and was published by the Farmington News Company. The Farmington News circulated from March 14, 1879 through April 7, 1976. The circulation reported in 1898 was 1200. The paper was 17 inches X 24 inches in size. 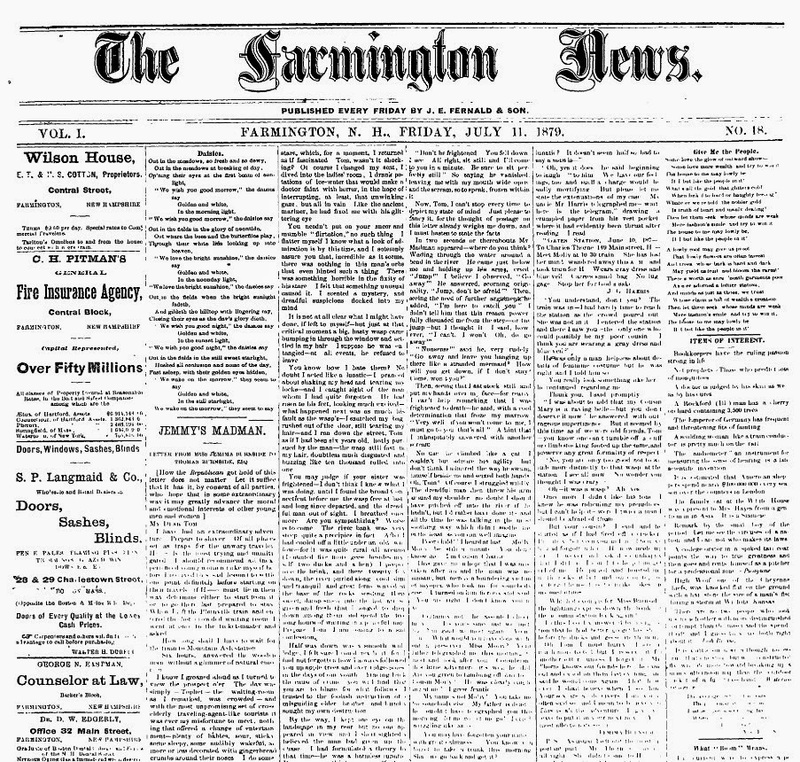 The first edition of the Farmington News was published on Friday July 11, 1879. The project began over a year ago and was the result of the Library having microfilm copies of the paper, but no operational microfilm reader through which the papers could be viewed. Patrons had to take the film to the Rochester Library in order to read it. While the original microfilm conversion was not the best quality, the digitization included cleaning the film as best as possible. Unfortunately, digitization cannot repair damages, so damages in the film are carried over to the digital copies and some of the text may be difficult to read in the older papers. This is most likely the result of smudging on the original copy of the newspaper that was transferred onto the microfilm when converted into film. While some of the original newspapers remain, the bulk of the issues were given to the late Roger Belanger, our unofficial town historian, when the newspapers were converted into microfilm in order to save space. The last edition of the Farmington News was published on Wednesday, April 7, 1976. To access the archive, click on the Farmington News tab on this website. You will be taken to the digital archives. If you need help with searching the archive, visit the "Help" tab. There are extensive instructions on how to search and locate the papers you want. Each page is offered as a separate file for viewing and can be enlarged on the screen. The Digital Archive of the Farmington News was provided to the Goodwin Library by the Farmington Historical Society. The Digitization was completed by Advantage Preservation, with offices in Iowa and Minnesota. Learn more about digitization at http://www.advantage-companies.com/preservation.